SINGAPORE: A Sambar deer was found dead along Old Upper Thomson Road on Sunday morning. While such animals were once thought to be extinct in Singapore, a wildlife activist said there have been more sightings of Sambar deers in recent years. Eyewitness Wong Ong Kok was doing his daily exercise when he came across the dead animal along Old Upper Thomson Road. The 63-year-old retiree said: "The head was somewhere around here, the whole body was lying here, sideways, (and) the backside was down here. The length of the animal was about one meter." The deer appeared to have suffered a broken leg. He said: "At first, I thought it's a wild boar - wild boar is a very common animal here. So I thought it was a big, dead wild boar. But when I got closer, it didn't look like a wild boar. But in fact, it looked like a deer to me. The body looked to be quite fresh; it's quite fresh because the eyes were still open, and only a bit of live flies resting on the eye and the nose." Executive director of ACRES, Louis Ng, said: "The deer in the photo is actually a Sambar deer. And these are native to Singapore. Although the zoo also has a population. We've responded to some cases already of people knocking down these deer." ACRES recommends that the Land Transport Authority puts up signs urging motorists to slow down in areas where such wildlife is known to roam. Executive Director of SPCA Corinne Fong said motorists should call its hotline if they spot an animal in distress so that assistance can be rendered as soon as possible. This isn't the first time that a deer has been spotted along the roads of Singapore. Two years' ago, Channel NewsAsia reported that a deer rammed into a car along Seletar Expressway. It suffered major injuries and had to be put down. A RARE deer was found dead along Old Upper Thomson Road on Sunday night, most likely struck by a vehicle. 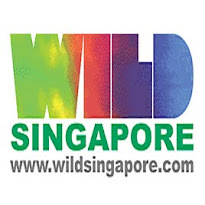 It was not a runaway from the Night Safari, which has a sambar deer enclosure, but one of a small wild population that dwells in the forested area of Lower and Upper Peirce Reservoirs. Naturalists estimate the population to be around 20 to 30. The deer, which emerge only at night, are secretive creatures, said Mr Tony O'Dempsey, chair of the Nature Society Singapore's vertebrate study group. Members of the society spot them only once or twice a year at areas like Adam Road near the Sime Road junction, he said. Sambar deer were thought to have become extinct in the 1940s due to poaching, and their habitats being destroyed. 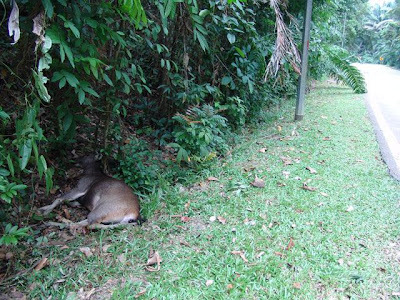 But in 2009, a pair of males were spotted at Bukit Brown cemetery. This is the second sambar deer to become roadkill in about two years. In 2010, one was killed by a car on Seletar Expressway. Despite the two incidents, experts said there is no evidence the wild deer population here is growing, nor is there cause for concern that they might become unmanageable. Recently, the growing number of wild boars in the same forested area led to a decision by the National Parks Board to cull some of the population. But unlike wild boars, which have more food sources, the lack of grazing ground limits the growth of the deer population, said Mr O'Dempsey. "This is an inconvenience that should not be blown out of proportion," said Mr Subaraj Rajathurai, director of Strix Wildlife Consultancy. 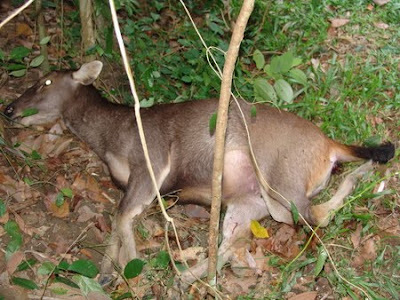 "We should see how we can protect the wild deer population as they are native to Singapore." To have killed a deer, he added, the motorist would have been driving above the speed limit of 40kmh for Old Upper Thomson Road. Residents and trail visitors were surprised to hear of the incident, saying wild boars and monkeys are common sightings in the area, but not deer. Said university student Charlotte Loh, 20, who was with her family at the trail to spot wild boars: "It makes the place even more interesting; we will want to come by more often."